I have a ton of store cards in my wallet and in the pockets of my purse. A lot of grocery store cards, cards for fabric stores, and a few punch cards. W﻿aaayyy to many to fit in my wallet. With all of these cards in there it won't snap shut. My wallet has been laying open in my purse for far to long and things (like money and the cards) keep falling out and end up in the bottom of my purse. NOT GOOD! Yesterday I had enough and decided it was time to take care of this problem and I made the cards their own wallet. So much better! I know y'all need one of these!!! They are quite handy. They can hold store cards, credit cards, business cards, and any other little card you might have. So grab your supplies and let's get to work! 4 Scraps of Fabric at least 8" x 8"
Cut your outside and lining fabrics into 8"x 8" squares. Also cut 2 squares of interfacing 8" x 8". Iron the interfacing onto the squares following the manufacturers directions. From the other 2 fabric cut rectangles 4" x 8". I cut 3 of each. Fold each rectangle in half, WRONG sides together, so it is now 2" x 8" and iron. Grab you lining piece. Starting at the bottom draw a line 1" up from the bottom. Draw 4 more lines each 1" above the previous line. Starting at the line closest to the bottom lay a pocket piece with raw edge facing AWAY from you on the line. Sew it in place using a 1/8" seam. Continue doing this until you have sewn a pocket piece on each of the 5 lines. Don't panic! You should have 1 extra pocket piece. We will add that in just a minute. Starting at the top fold the pocket pieces up and iron in place. Now grab that extra pocket piece and pin it to the bottom. This time the raw edge will be pointing towards you. Draw a line down the middle (4") and then sew. Now lay other square on top of the pocket square. Make sure right sides are together. Sew using a 1/2"seam allowance. Make sure to leave an opening to turn it right side out. Turn right side out and iron. Whip stitch the opening closed. Sew on a snap as pictured above. Hope you are having a wonderful weekend!!!!!!! How clever! I love this and hope to find a little time this weekend to make one. Thanks for the great idea! Love it!! I think I see one of these in my future :-) When I do make one I will link back to you....and let ya know. Thank you for posting!! What a cute idea. I will definitely have to remember this. I'm your newest follower. I would love it if you linked your project up to my link party. That is so cute, and thanks so much for taking the time to do a tutorial! Love it! Thanks for the tute. Love it! I just added this to my "to do list" Thanks! Wow I loooove this! Such an awesome idea. Thanks for the tutorial, I am going to try and make one next weekend! I am SOOOOOOO making this! 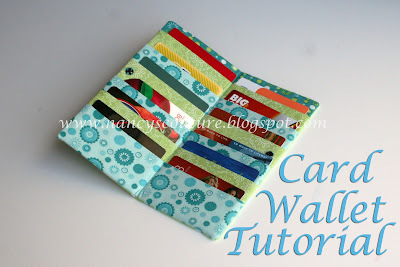 I swear most of my wallet is made of store cards--this is a great solution to that! Wow you gave a very detailed tutorial. I can't wait to get started, this is such a great idea! This is fabulous. Great tutorial. Thanks so much! I'm going to be making this for sure. I think everyone has this problem. Great solution!! Very cute! I love it and I love the fabric! Great job! Love Love LOVE this! Thanks so much for the tutorial! New Follower! What a great idea - love your fabric colors too! Thanks for sharing. I NEED to make one for myself!!! I'm having the same problem with all my store cards. Thanks for the tute! My daughter and I just made this! Fun! It was very easy to follow the only adjustment we had to make was for the pockets; we had to make a 12x8 in order to get the 3 strips. How sweet! I love the fabric you chose! Great idea...I'm going to have to try making this at one point. It's awesome. Thanks of sharing!!! On the part you say to fold the 4x8 together, right sides together. Is it actually supposed to be wrong side together, right side facing out? I'm making this as I type and am questioning myself on this step. I just made 4 of these plus altered it to make a check book wallet. Love your tutorial, thanks! Very well written. ooh! my first thought on reading the list of supplies was 8x8! spoonflower swatches!! This is lovely. I know what I'll be doing with some of my swatches now! I LOVE this!! I've got it in my file to feature--not sure which day, yet, but I definitely need to feature this awesome idea!! You are so inspiring! What a great idea!!! I can't wait to make one of these! Thank you so much for sharing this tute! Thank you so much for posting this tutorial. I made the wallet tonight, my only thought was that if it was just a tiny bit wider (maybe make the seam allowance for the final sewing be 3/8" instead of 1/2"?) that it might make it fold with the cards just a tiny bit better. It's beautiful and super useful though. :)Thanks again! Cant wait to give it a try. Thank you for sharing. What a great idea! Thanks for sharing! Ciaooo dall'Italia! No prob you can make another blog for business cards. Its pretty card holder for a lot of cards in one holder, can it easily be put inside a pent pocket. Wonderful idea! We all need room for MORE CARDS!! LOL thanks for the great tutorial. Will post pics when I get 'em done!